Two Great Friends—Ready to Go! Pikachu and Eevee join up in the Pokémon TCG: Pikachu & Eevee Poké Ball Collection! This collection features two all-time-favorite Pokémon in a joyous, beautifully sculpted figure and two new foil promo cards—a great addition to any collection. Plus, the Poké Ball has a secret compartment inside that holds up to 60 Pokémon TCG cards! 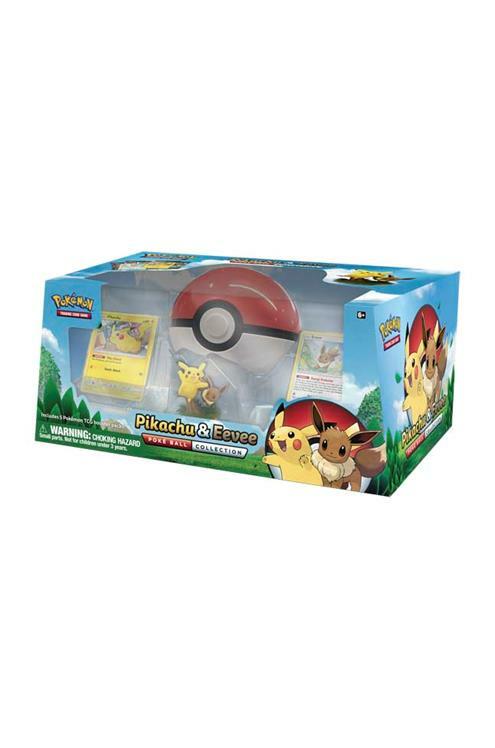 The Pokémon TCG: Pikachu & Eevee Poké Ball Collection includes: 1 figure of Eevee and Pikachu playing together 2 never-before-seen foil promo cards featuring Pikachu and Eevee 1 Poké Ball big enough to hold a stack of Pokémon TCG cards 5 Pokémon TCG booster packs (Each Sun & Moon Series pack includes 10 cards and 1 basic Energy. Each XY Series pack includes 10 cards.) 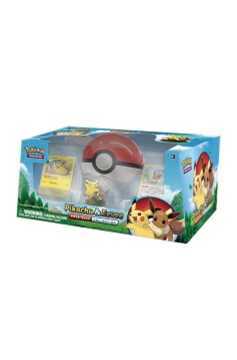 A code card for the Pokémon Trading Card Game Online Cards vary by pack. Packs may vary by product..